My college classmate RJ Serna learned that I'm a beach addict. He suggested that I should see Bulalacao which is in the southern tip of Oriental Mindoro. I think of it as a kept secret. Only few people knew about the place. It was the last long weekend of 2009 when Ma'am Cinch, Ate Avic, Ayel & my sister Lanie joined me in this adventure. It was tough researching about the place, google lost its magical powers I guess. There isn't much infos scattered on the web. I was able to stumble upon Tambaron Green Resort, cottages in a secluded island, it's just what I was looking for. The thought of it was so inviting. On our way to Bulalacao, we rode in Dimple Bus straight to Bulalacao, passing through the Batangas Port to Calapan. We are able to catch the bus ride with the owners of the resort, Mr. Fajardo and his family. The 10 hours bus trip turned out to be 13 because of the truck accident. When we reached the town, we had a humble meal of fish & veggies at a small eatery while waiting for the sea water to rise because it was low tide. The weather then was best for our travel,with clear blue skies. Kuya Asis & his friend went with us. Rj's father sent him for our adventure. We rode a small boat to reach Tambaron Island. We passed through stretches of beach, several islands & beautiful white beach coves. Tambaron is unequaled with the neighboring islands. The island is full of lush green trees and thick foliage which Mr. Fajardo had planted years ago. Tambaron Green Resort is set in a cove facing the west. There are several native huts made of bamboo along the shore. The cottages are distributed on the back. The beach is made out of coarse & fine corals. The word "escape" struck me upon nearing the resort. We had it all to ourselves. If you want to leave everything behind for awhile, this is the place you should be in. We chilled out in the huts with the sea breeze lulling us up to relax. The view of nature sways us to relax more. When we arrived Ma'am Lily prepared us snacks of delicious Nachos & red tea. We strolled at the beach. And that afternoon, we watched the soft hues of the beautiful sunset. We swam that night. We had a dinner of fresh giant crab. We were off island hopping. We cruised on a big boat to Suguicay Island. It's far & everyone was excited. The right portion of the island is full of mangroves and on the far left there are big trees & black lava rocks, and in the middle a span of fine beige sand. The beach is beautiful with its calm waters. Even if the heat of the sun is unfriendly we didn't hesitate to take a dip in the clear water. There are big starfish scattered almost everywhere. We even saw a dead big popper fish. In Suguicay, there are lots of fishermen. We even bought fresh Blue Marlin for 80php/kilo only which the boys grilled. The woman was also selling a big squid and a baby octopus which we didn't buy because it will be tough to chew on. We really enjoyed the picnic under the trees, we loved the lunch Ma'am Lily prepared for us. To reach the second island we had to bravely sail through the scary waves. It was as if the boat was floating/ surfing above a big chunk of wave. We were riding on a one storey high wave, which is exciting and scary at the same time. After more the 30 mins., we reached Aslom Island. It's almost in the middle of nowhere. It's said to be owned by The Lhullier Family from Cebu. It has a wide strip of beach which is sand bar with waves crashing on both sides. It's windy out there. It's almost like the white island of Camiguin. On our way back, the waves are splashing on us, its like white water rafting, we all got wet. We also visited Maasin Island, a fishing baranggay to see the captured "pawikan" sea turtle. It's not really advisable to keep one as pet, but then again there are really hardheaded people. We took a swim, and the sand at the bottom is powdery fine, though its not purely white. It reminded me of the fine sands of Bohol Beach Club, when the sand is like coffee mate. On our way back, we snacked on "Puto Maya", sticky rice with red beans with a sweet syrup. 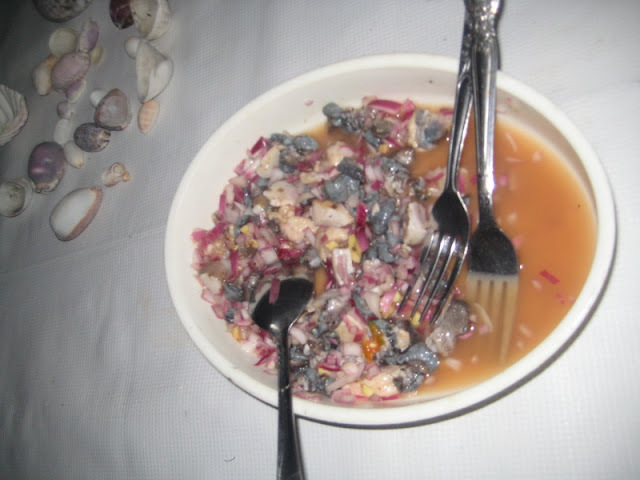 When we reached Tambaron, we snacked on "pancit" and tried on the sea urchins which is a bit of a challenge to open. That afternoon, we went to get a "taklobo" big clam near the shore. It's a delicacy in the island. That night we went with AJ and watched the locals catching some fish at the pond. It was a fun experience. They used a net and they eventually caught some fish, shrimps and lots of snakes. We were counting the snakes they caught, it was less than 20. One of the snakes thought it can escape, it was biting a fish which was glimmering in the water, so it wasn't hard to see it in the dark pond. After that experience, we had chitchats at the hut while tasting the "kinilaw na taklobo". It's raw and chopped with onions, ginger and vinegar. It almost tastes like oysters but with a firmer texture. That night Ma'am Cinch slept outside in the open hut. We woke up early in the morning. We ate the fish we caught the night before for breakfast. We went hiking up the hills of the island. It's an easy hike. We passed by trees, & our guides went before us, cutting/slashing away the cogon grass to clear the path. It's breezy up there, the view is breathtaking. I would really love to have a house on top of a mountain overlooking the ocean. It's really a beautiful scene, the sun was shining casting a golden silver glow upon the deep blue ocean. We even saw a hole, beside the path, they dug it in the days Mr. Fajardo was treasure hunting. We passed by the enchanted forest. On our way back we passed by Mahogany Trees, Banana Trees, giant bamboos, & Pomelo Tree. We picked up the ripe Pomelos which we saw lying on the floor. What's nice in Tambaron Island is you can really live there. It's a self sustaining island, with clean fresh water, fresh fruits and fresh catch. By the way, the Pomelo is sweet, with a nice pink color. And to add there are crabs too. We sailed to the other part of the island to Carbon Beach. We swam for awhile. It also has a fine white beach, almost deserted. For lunch, we ate crabs freshly caught & Tinola Kabir Chicken. That afternoon, we had to get back to Manila. Our travel to Bulalacao is the most unplanned one. It's one of the most surprisingly enjoyable travels. Mr. Fajardo & his family is very accommodating and so generous. I never expected them to be so. We felt really comfortable & safe in Bulalacao. We would recommend everyone we know to visit the place. It's really an "island escape", no signals, no noise, you'd be able to relax & recharge. That afternoon. we boarded on an Alps Bus to Manila. We passed by the Mangyan settlement. Mr. Fajardo told us that before Mindoro was colonized by the Dutch for years. That's why there are locals who seemed "meztizos or tisoys", they are the descendants, they are called White Mangyans. One night, he also told us the story of why they call the island Tambaron. Tambaron is the name of the fisherman who was a castaway the island, he fell in love with the fairies of the island. One time, a friend went to the island and came to search for him, calling out his name"Tambaron, Tambaron...", hence that's how the island got its name.